Would you work harder for more money? What motivates you? Do you know? Do you think you would work harder for more money? 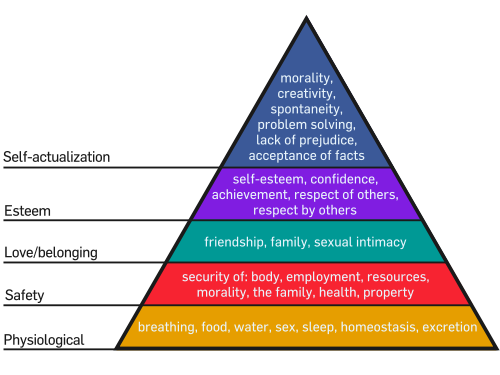 According to Maslow’s hierarchy of needs once our physiological and safety needs are satisfied, we need belonging, esteem and self-actualisation – things that can’t be bought, and that having more money won’t really deliver. Look around at your colleagues, I’m sure you’ll find someone motivated by the social aspects of work, the guy who gets everyone coffee, who knows everyone’s story, and who might organise social events for the team. They’re sometimes called “the glue”. You might also find someone who seems to be motivated by money. Perhaps they’re rather interested how their salary compares to that of their colleagues. Dig a little deeper; money might be how they measure status or achievement. Most of my team measure achievement by projects completed, problems resolved or value delivered and are motivated by that. For truly creative types the act of creating, the opportunity to be original is motivating in itself. This can also apply to those deep geeks who are into writing “elegant code” as one of my favourite geeks calls it. So does money come into our motivation at all? Yes. If we believe we are underpaid it is demotivating according to Herzberg who categorised salary as a “hygiene factor” in his two factor theory of motivation. But paying ourselves more won’t proportionally raise our motivation. How do these factors play out? There’s currently a big debate in the UK regarding bonuses being paid to RBS investment managers. The controversy arises because the UK government now owns a significant part of the bank, and in the current economy it’s very difficult to see people who could now be seen as government employees getting a bonus when no other government employees will. But the argument from RBS is that they will lose the people needed to rebuild the bank if they cannot pay bonuses competitive with other banks (not all banks are limited in this by government ownership, Barclay’s for instance has not taken a capital injection from the UK government). This can be framed as a motivation problem. The RBS needs to motivate its employees to rebuild the company, but they employees are demotivated to the point of leaving if they do not receive a bonus in line with competitor companies. Perhaps because they seem themselves as then not being paid a fair salary that reaches the “hygiene level” prescribed by Hertberg, or because they are status driven and measuring that status by money earnt. At the time of writing it seemed likely that the UK government would relent and allow RBS to pay bonuses as planned. However at least one eminent commentator, Henry Mintzberg, argues against bonuses, particularly for executive level managers. In his view bonuses do not reward actual contribution, and are likely to motivated the wrong behaviour of executives. Do you know what motivates you?